1937 On 2 October an article, “Let’s Throw the Enemies of the People out of the Front of Fine Arts” is published: Kochar is accused of “anti-Soviet propaganda and anti-revolutionary activities”. 1939 Within the framework of the celebrations of the thousandth anniversary of “David of Sassoun”, the Armenian national epic poem, the Russian language academy edition comes out with Kotchar’s illustrations. Editor and publisher: Academician Hovsep Orbeli. Kochar creates the first version of the equestrian monument “David of Sassoun” which was destroyed barbarously during the days following his arrest in 1941. 1941-1943 Arrested on 22 June. Was released in August 1943, due to the intervention of Karo Halabian and Anastas Mikoian, his friends from Nersissian School. 1955-1966 A movement starts in Paris aimed at inviting Kochar to France and organizing exhibitions of Kochar’s works created during the Soviet period. For this purpose, a number of prominent figures of French culture sign a petition. “Eagle of Zvartnotz”, a landmark and memorial monument (bronze), is placed on the road to Zvartnotz Temple. 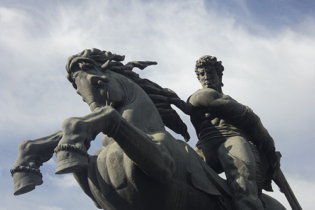 1959 The equestrian monument “David of Sassoun” (wrought copper) is placed in Yerevan Railway Station Square. 1965 Thirty years after returning to homeland, Kochar’s one-man show opens for the first time. 1966 The one-man show “Kochar et la peinture dans l’espace” opens at “Percier” Gallery in Paris, without the artist and his works of the post-Paris period. The catalogue, “Kochar and Painting in Space” by Waldemar George is published. 1966 The statue to Komitas (wrought coppper) is placed in the central square in Etchmiadzin. 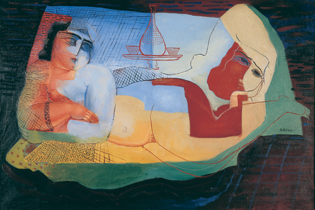 1966 Kochar’s second one-man show opens in Yerevan. 1966 The album “Ervand Kochar” by Henrik Igityan comes out. The sculpture, “The Muse of Cybernetics” (wrought copper), is placed in the yard of Yerevan Computer Research and Development Institute. 1973-1974 An one-man show opens in the Museum of Eastern Peoples in Moscow. 1975 The equestrian monument “Vartan Mamikonian” (wrought copper) is placed in Yerevan. 1975 By the Decree of the USSR Supreme Council, Kochar is awarded the title of a People’s Artist of the Soviet Union. 1978 An one-man show of Kochar’s graphic works opens in Yerevan. 1979 Dies on 22 January 22 in Yerevan.